For the person that travels by bike for several days, several weeks or several months, choosing the right tire for the tour may assist in the enjoyment of the tour either by improving speed and comfort of the ride or perhaps making the ride flat free. Fortunately, and perhaps surprisingly, there is a large selection of tires to choose from. There is also a lot of advice from various forums and blogs, some of it from bike travelers that spent years on the road in remote parts of the world on roads that would be classified as high-clearance jeep roads in the U.S. The question for bike travelers is; “Do you need a tire capable of world travel for a 3-week bike tour from Salt Lake City to Yellowstone NP and back” and “Should I use tires specific for each tour’? Tires for touring are about durability, stability, speed, comfort, price and the feature of a folding vs. non-folding tire. Buying a tire for one characteristic, such as high durability, will most likely decrease other characteristics such as speed and perhaps comfort, making purchasing decisions more complicated. The Schwalbe Marathon Plus is a 700 X 38C and 960 gram tire rated 5 stars for durability and protection but only 3 for speed. Photo by Lou Melini. The choice of a touring tire will depend on the length of the tour, typical roads that one travels on, your body weight and the weight of the gear, your aversion to punctures, and how big of a tire will fit on your bike. I will focus this article on tires for road and maintained gravel roads and not off-road bike packing tires. I do not have enough experience with off-road touring where tire pressure may be a larger consideration with off-road bikepacking tires that have a larger air volume. I will also not discuss tubeless tires for bike touring. I do not think there is enough generalized touring experience to objectively evaluate tubeless tire for road touring, though I know that tubeless can work on off road tours. The tires discussed in this article will be 700C (ETRTO 622) with widths of 25, 28,32,35 and 38C (ETRTO 25-40) so that a 700 X 35C tire will have an ISO/ETRO # of 37-622. Certainly one can use a 23C tire or one larger than 38C for touring, but most people use the 25-38C range for road touring. For overseas travel in Asia or South America it is recommended to use a 26” wheel and tire (ETRTO 559). Some of the information that I am providing is from SheldonBrown.com. If I comment about a “wider” tire, I am referring to a 32-38C tire and a comment about a “narrow” touring tire being 25-32C. For the purpose of terminology consistency, I may be referring to the tires found on the Schwalbe tire website, one of several tires brands I have used for touring. I have no affiliation with Schwalbe as I have also used tires for touring from Vittoria, Continental, Panaracer and Specialized. In addition you may purchase tires for touring from Vee Tires, CST, Michelin, Clément, Compass and “non-touring” tires such as ‘city’ tires or cyclocross tires. Durability: As a general statement, durability can simply be defined as any tire that completes the intended bike tour. As a technical definition, durability refers not only to the number of miles the tread will last, but also to how well the sidewalls hold up to cracking and resisting cuts. Some tires will have an additional puncture resistance layer incorporated into the tire. Keep in mind that changing a tire due to wear can be a planned part of your bike travels in order to ride on a lighter tire. You will find that the more durable the tire the heavier it will be. A 700 X 35C (non-folding) Schwalbe Marathon Plus HS440 tire with SmartGuard flat protection weighs 900 grams compared to the 35C Marathon Supreme HS 382 (folding tire) at 440 grams. In my experience, probably all cyclists traveling around the world that have stayed at my house use tires in the 800-1000 gram range. I have also had a cyclist traveling across the U.S. on 25C tires, a tire no larger than what most recreational cyclists use on social rides. Flats are always an annoying part of any tour. Tires that promise to be “flat-proof” are popular, but add to weight. I think a flat-protection layer is a nice feature on a tire designed for bike travel. There are several in-house brands among manufacturers and several types of flat proofing incorporated in a tire tread by a tire manufacturer such as Schwalbe. I do not have enough experience or engineering knowledge to rate the different types. On the Schwalbe website the varying types of flat protection can weigh 100-200+ grams above the type of protection incorporated in the marathon supreme model that I have. Nearly all of my flats occur for a couple of reasons. I run my tires too long so I get flats due to excess wear. The second reason is simply bad luck. I’ve had 2 flats from goatheads (puncturevine) on 2 tours using the D & RG bike trail north of Kaysville. Another source of flats is on roads frequented by heavy trucks. The flats come from staple-like pieces of metal thrown from truck tires due to wear. Julie and I have had a combined 3000 miles with one flat on some of our tours. On our 1350-mile Canadian Rockies tour neither one of us had a flat. Speed: How fast a tire rides is usually a function of the weight of a touring tire. These tires may not be as durable as larger tires but for a trip of less than 1000 miles they should be durable enough. As I previously mentioned, one may not care about durability and would rather replace a tire more frequently to gain speed. Lighter tires (28C) in my experience should be able to satisfy stability concerns on smooth gravel roads and packed limestone trails. Comfort: Comfort in a tire is a rather subjective term for a tire that rides fast without the rider feeling the vibration from the road. Comfort of a tire will be a function of air volume, high thread count (TPI) of the sidewalls and tire pressure. Too low of a tire pressure will increase risk of pinch flats. Lighter sidewalls with high TPI are more prone to cuts. Compass has light tires with higher TPI than the other brands of touring tires I mentioned. These tires should be a comfortable, though I question the durability. The website claims a 3-mm tread enhances the durability. Folding tires: One of the reasons I choose folding tires is that I always carry a spare tire on a tour. Some people scoff at the idea of the extra weight of a spare tire and advocate hitchhiking or a tire boot if a tire becomes severely damaged. I’ve been in at least one situation where neither was an option. I also feel that I am more independent with a spare. If one needs a tire, you can usually find one at a bike shop. My experience is that the inventory of touring tires will be limited to a 28C tire. Folding tires are lighter than non-folding though the difference may be too small to consider. For example the Continental Gatorskin folding 700 X 32 is 70 grams lighter but there is only a 10-gram difference noted on the website for the Schwalbe Marathon Mondial model. Folding tires are generally easier to mount and remove from a rim. This feature may also cause the tire to blow off the rim during inflation if not mounted properly, which I have done a few times. I do not see prices on most websites but folding tires are usually more costly but some of that cost difference may be due to other performance features in the tire. So is there an ideal tire? When Julie and I travel on our bikes we are on paved roads, though we have hundreds of miles on packed gravel roads and packed dirt and crushed limestone trails. If I need to purchase a touring tire, I currently look for a folding tire in the mid-300 to 400-gram range with a width of 32C. This weight and size range gives me a good balance of speed, comfort, durability and stability that I desire for the touring that I do. 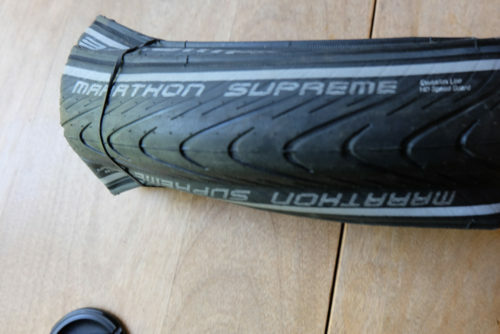 For whatever reason, 32C Schwalbe Marathon Supreme and 32C Continental Gatorskin hardshell tires were unavailable this year (2015) so I went with the Marathon Supreme 35C at 440 grams. Though I prefer a 32C tire, I put 28C tires weighing 310 grams on Julie’s bike (along with lighter rims) to help equalize our abilities. She has not stated any concerns with stability. I might use 28C tires if I am touring with a younger and stronger rider. Julie and I do not need a very large tire, as we do not ride on rough enough roads to need tires larger than 32C. A 35C tire is more than adequate for our needs. 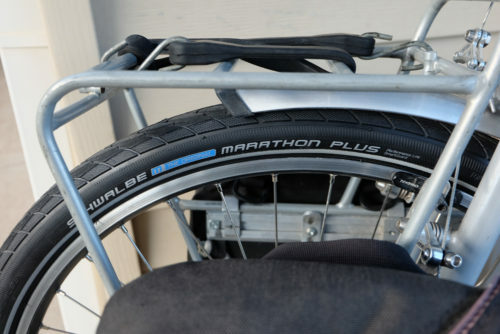 The Schwalbe Marathon Supreme. Lou's tire of choice. The tire is 440 grams for the 700 X 35C. 4 stars for durability but 5 for speed and protection. Photo by Lou Melini. I used a cyclocross tire on the rear of my bike for a recent tour that took me on Ant Flat road, a 15-mile rough dirt road that runs between Hardware Ranch and Monte Cristo Road (SR39) in northern Utah. The cyclocross tire was comfortable with the large air volume. It does not have a flat-proof layer so this could be an issue. The Michelin Jet I used weighs 330 grams. I wished I had put a similar tire on the front wheel as well. There are now “gravel” tires available from Panaracer, Maxxis and Challenge. The 32C size by Panaracer is the largest tire at this time in their gravel line-up and weighs just 320 grams with a puncture resistant layer. If gravel is part of your travel, perhaps this is the tire for you. As a side-note, there are some blogs that would argue for “name-brand” tubes such as Schwalbe as they claim to hold air better and will be more likely to be free of defects. I do not have a strong opinion or experience with this advice. In summary, your ideal touring tire will depend on a lot of variables. Many experienced bicycle travelers have their favorite tire, while others ride with whatever came with their bike or available at their local bike shop. My current “ideal” tire may not be your ideal tire depending on the variables I mentioned earlier in the article. Don’t get too hung up on tires. If you start your tour with tires in good condition and appropriately inflated you should be fine. I hope that this article gives you a little more insight and thought when you look at your tires.